François-Marie Arouet de Voltaire was, to use a term not well translated into English, a provocateur. To Voltaire, most people did not “dare to think,” and his contempt was in equal parts for them and for powerful individuals and institutions that took advantage of people’s disinclination to use their minds. “Ecrasez l’infame!” was his motto, another expression that really doesn’t translate at all. Basically it is an exhortation to challenge deliberate and manipulative untruths wherever they are found. Voltaire’s crusade to do just that led to a lifetime of trouble with the church and the government, resulting in imprisonments, banishments, and, in the end, lasting fame as the greatest French writer of his age. Among the stories Voltaire relates to Lili, the protagonist of my new novel, FINDING EMILIE, is of a time when his room in a Parisian boarding house was searched by police looking for incendiary writings. He told the officer in charge that he had dropped them down the privy, which was an outhouse-style facility on the upper floor. This zealous officer had the privy searched, tunneling through pipes filled with excrement until the pressure caused a rupture and the contents sprayed into the tavern on the ground floor. Turns out Voltaire hadn’t dropped anything into the privy at all, but had come up with this nasty way of punishing someone willing to be a slave to the censors. Such attitudes, or course, made him one of the most hated men in France by those who benefited from keeping a lid on free thinking. Voltaire spent time in the Bastille and was banished to England for several years, where his preference for English political thought and institutions added fuel to his writing. Publication of his books was banned in France, but they were produced abroad and smuggled in, adding to the mystique of Voltaire’s reputation as a verbal renegade. Arrest warrants remained open for Voltaire most of his life, and the question was only if, where, and when a warrant would be enforced. To ensure a means of escape, Voltaire lived near the French border, close enough to get on a horse and ride to safety on a moment’s notice. Two of these retreats figured prominently in his life. 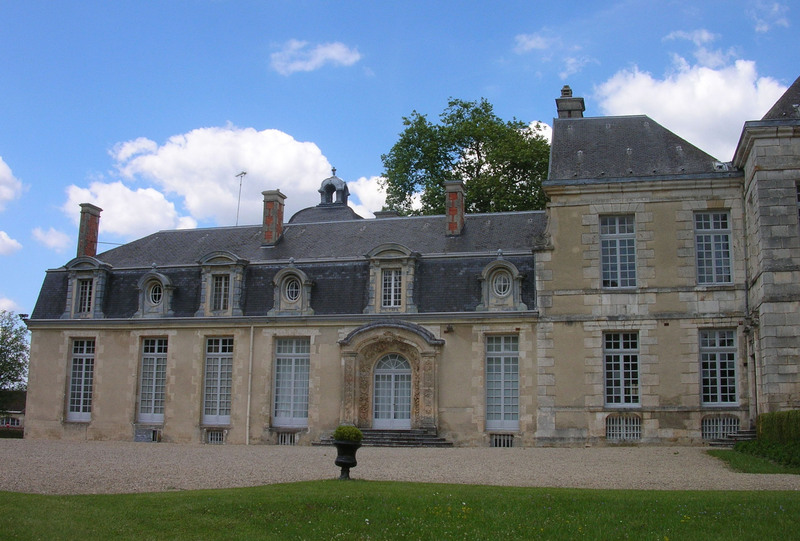 The first, the Chateau de Cirey, was the ancestral home of the Marquis du Châtelet, husband of Voltaire’s lover, Emilie. The marquis interceded for Voltaire at one particularly desperate juncture, offering to sequester him at Cirey, in a remote part of the Champagne region. The Marquis du Châtelet knew than his wife and Voltaire were lovers, but he didn’t care. His was a marriage of convenience, and the selling point for the unusual arrangement was that Voltaire was quite wealthy. The chateau was in terrible disrepair, unsuited for a long stay, and Voltaire agreed to spend his own money remodeling, restoring, and expanding it. I guess to the marquis this seemed a reasonable trade for sleeping with his wife. The photos I took at Cirey show that the remodeling was never completed. The original building is the higher part. It became one of the wings, and Voltaire and Emilie supervised the construction of the extension that became the central section of the chateau. The matching wing on the other end was never built, nor was the top floor of the new construction. Emilie and Voltaire lived at Cirey on and off from 1734 to 1749. It must have been hard for two such sociable people to live away from Paris and the glitter of the court at Versailles, but the compensations were substantial. They built a state-of-the-art physics lab and a library to rival that of any university. The pair were such an important part of the intellectual scene that many important people of letters, science, and society came to visit them. When I visited Cirey the owner and resident, Madame de Salignac-Fénelon, told me that tourists (mostly Japanese and American) come through when the chateau is open to the public in the summer, but that they are usually on Voltaire tours, visiting the places important to his life. Most have only a passing acquaintance with the aristocratic woman who took him in. I hope FINDING EMILIE changes that, and that Emilie tours will soon descend on Cirey and all the other sites of her life! Emilie died in 1749, and Voltaire’s other hideout, the Chateau de Ferney, became his home from 1759 until his death in 1778. Situated on the Swiss border only an hour or so from Geneva, it too had the advantage of allowing for a quick escape. The house is quite small for a chateau, more a mansion than a palace. Voltaire bought the entire town of Ferney along with the chateau, and used it as an experiment in social engineering. He drained swamps and created productive farmland and vineyards, established local industries (including clock and lace making), established schools and social services, and brought the people of the area out of poverty and ignorance. A statue honors him today in the renamed town of Ferney-Voltaire. Voltaire wanted to be buried at Ferney, but fate decreed otherwise. He died in Paris, but his body was embalmed so poorly that it had to be buried quickly in a village church somewhere along the route between Paris and Ferney. In 1791 his remains were taken to the Pantheon, where his tomb can be viewed today. The odd, unused tomb he constructed at Ferney, half in and half out of the little chapel on the grounds, can still be seen today. Many thanks to my friend Laurel Corona for this post, and congratulations to her upon the release of her remarkable novel of the French 18th century, FINDING EMILIE!